Well I took the slide off of my Firestar .45 today just to check things out. I dont know how it happened, but it went easily back on only not correctly. I cannot fix it, please help! The slide stop went back in before the reference lines 'lined up". I cannot get it back out. The gun is together, but the slide is in a forward position. There is about a 1/4 inch play in the slide, but for the life of me I cannot disassemble the weapon. I have no idea what happened, it went together very easily and the slide stop pin seated with little effort. The gun is cocked, the slide is in a forward position and I appear to be screwed. I can get a little bit of a screwdriver blade underneath it, but I dont want to force it too much. Is it possible that your slide stop pin missed the barrel cutout when you installed it? If that happened, I'm having trouble figuring out how the slide got all the way forward without you noticing the problem. Any way to take some pics of the thing so we can maybe see what it up? 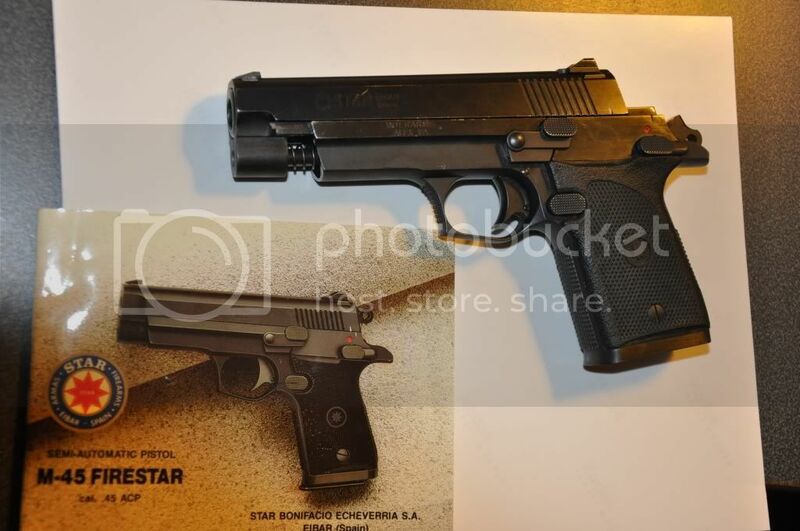 I've got a 9mm Firestar so might be able to figure something out if we can identify what happened. Firestar M45. This pic shows how the gun is currently. The manual is there too, that is how the gun should look. I had the slide block arranged so it would go in as I assembled the slide to the frame. I had my thumb on it with very little pressure. It went in before the marks lined up and now I am beating myself up trying to get the slide off again. My fingers are raw from trying to push the pin out. I have a brass punch and I have only managed to scrape brass onto the bluing trying to use it to push the pin out. As the other person said, take the pin back out, line up the marks and reinsert it. By the way, I consider the Firestars to be real "sleepers", they are an exceptionally good design. I got the impression mine (.40 S&W) wasn't accurate, so I set it on a rest and got a surprise, it is very accurate for such a short compact gun, or even for a full sized gun. I don't know how you could ever hurt a Firestar, built like a tank, and almost as heavy. That's just it, I cant for the life of me get the pin out. It seems to be stuck. It wont give. If you can, assemble yours like I have mine in the picture and let me know how to get the pin out, okay? Took some pics of my .40 (forgot I had it!). First pic shows the slide/frame in the assembly position. Note that the barrel slot isn't positioned properly for the pin to be inserted. The slide goes back a bit farther than the alignment marks, push the barrel in, insert the pin to engage the barrel slot, then slowly let the slide forward until the stop tab slides through the slide slot. If you hold the gun like in the pic it is easy as pie. And, note the notch in the rail for the slide stop tab to clear the rail. Second pic is the slide stop with aforementioned tab. Third pic is the slide showing that there is only ONE place for that tab to get past the rail. Now.....the problem. You cannot move the slide back because you have the pin in and the barrel hits it. You have to move the slide back to uncover the notch for the slide stop tab to clear the rail.....but you cannot. I'm having a bit of a time figuring out how you got the slide stop in before you got to the notch. Your slide/frame must have some clearance because mine would never go in like that. (gun has hardly been fired) If it went in....it must come out. What is going to make it harder is the tab has a bevel on the far side that helped it push the slide up so it could get under it. The near side is flat so you don't get any wedging help to get it back out. You are going to have to lift/tilt the slide as much as you can and push the slide stop down as hard as you can while pushing it out. It went in, it has to come out. That leading edge of the tab is going to be catching the rail but once you get it under it you will be golden. I can't think of any other way to go here. You can't take the slide off frontwards because there are a couple thinning cuts of the rail right there which make it thin enough to clear the stop. It isn't going forward. So the pin MUST come out. Sorry I can't be of any more help. If you can't get it out....a call to the local gunsmith is in order as Star is defunct. I'm not sure what the GS will do other than what I have suggested above. Good luck dude! I hope I have not broken or bent anything... Although the thought to try and cut the pin so it falls out the other side has crossed my mind. I might pay dearly for a new one though. Nothing ~ I am frustrated and beat. If you have tried everything else, cut the spring and take the tension off. Replacing the spring should be easier and cheaper than replacing the pin. Seriously though, take it to a smith. G3: Because I'm not a girl. I wouldn't be hitting the pin on the right side, rather pry it from the left. Maybe a very small screwdriver that can push the slide stop down while pushing up on the slide. Grind something to fit if needed. There might be an imperfection in the slide that allowed the stop to slip by where it wasn't supposed to. Try moving the slide as far as you can forward and back and see if there is a place where the stop might fit easier. You've got a tough nut there to crack. And, remember that the Firestar parts are limited and hard to find. Try hard not to destroy anything! Edit: HM2PAC....which spring are you referring to? Recoil spring? Won't help. That isn't what is keeping the slide from going back. The barrel must drop to disengage the recoil lug, but it can't where it is because the lower frame won't allow the movement. Slide can't go forward because slide stop lug is pinched in the slide cutout. Nasty situation here! Oh and did I mention my now deceased father asked me to hold onto this gun for him this past July for safekeeping? He felt that if it were in the house, he might go and trade it in for a shotgun. I feel like a 'big dummy'. All I wanted to do was take a look at the proofmark. There was not clearance for the pin when the 'marks' were lined up so I moved the slide forward while I still had my thumb on the slidestop pin and POP in it went. Thought #1 ~ Cool it went in after all! Thought #2 ~ Wait a minute, something aint right! Is there any clearance at all between the slide stop and frame? If you can loop some tough nylon thread between them several times, you could use that to try to pull out the slide stop. The more loops the better so that the force is distributed over the part rather than localised, though you do want to avoid bending the part. This method will eliminate the potential scratching/gouging/bending damage that prying tends to promote. Wow, that is really screwed up. Thanx for the explanation Rob. As long as you don't mess the gun up, you didn't do much wrong. Unfortunate but not stupid. Bit of a long shot, is this circumstance covered in the manual for the weapon? I can attest to this situation NOT being covered in the manual. Don't think they ever envisioned such a thing happening. After mulling this one over....there must be a spot on the rail where it is shallower to allow the stop to get past (besides the assembly notch). I'd try to wedge the slide up while wedging the stop down and move the slide fore and aft. Yes....you need to grow another hand to do this. It HAS to come out. Don't despair. Things like this happen to all of us. If it went in with little effort/pressure, you just have to get things lined back up the same exact way and it will come out with that same amount of force. Do you have a gunsmith in the neighborhood? Just trying to see what the fallback position could be in case you decide that discretion is the better part of valor. We're all rooting for you here! Could try removing the grips, might help you figure out what is getting hung up and where. HEY! That is a great idea! I just looked at mine and can see the slide-lock tab through the magwell. With the grips off, you can probably get a screwdriver in there and pry the thing out past the rail. Best idea yet on this problem Yeti! I've looked mine over and cannot figure out how you did that. One solution would be to drill out the pin, that means a milling machine and many years of experience wouldn't hurt. Then after you get it apart build up the pin with weld. That part is cast, but a good welder can weld it back up. Better yet find a replacement. Not very likely on that last suggestion. That little window that the pin slips through when the holes line up is a very positive design, much more positive than a 1911's, I just can't understand how you got the pin in without the assembly lines lining up. At first there was no give at all in the pin. Now it has about 1/8 inch of movement and is nearly flush with the frame on the other side. (the side you push on). Well, looking at mine when the pin is out that far I think the retainer is past the slide rail's interference, something else is holding it in now. Pry under the left side with an aluminum or brass prybar (You'll have to make one out of a piece of metal) and pry on it hard while a friend raps on the pin from the other side with a hammer and punch. Please give us a final report. Congrats! Sounds like you're building a relationship with a good 'smith too. glad you didnt have to cut up anything on it. Great news! The little Stars' are fine pistols and seeing one in such distress was upsetting. We ARE sure we won't get it jammed up like that again, aren't we? (kidding in a friendly way). Still can't see how it was able to be jammed like that. Did the Smith have any opinions on how it happened and how to prevent it from happening again? Anyway....glad it is OK now!